One of the downfalls on being a nurse is wearing the same white uniform every duty. As much as I want to unleash my stylish side every day, apparently, it is not possible to wear any other uniform other than our clinical outfit. I miss wearing anything I can when I used to work for a Marketing and Sales office before. So for today's Style Template Wednesday, I created layouts for boys and girls that might help them on their future office jobs or OJT's. 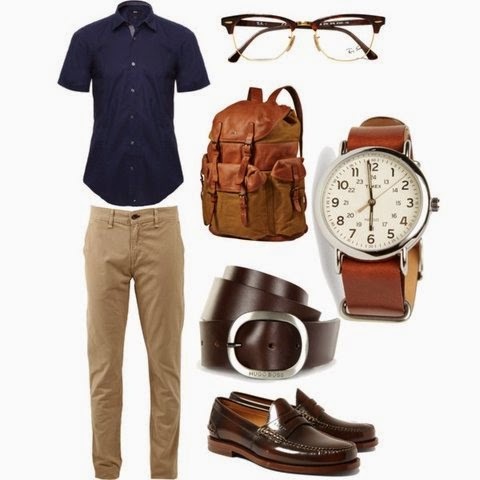 If you will seek my advice on what is the best office wear every day then I will go with this simple look. I will sport this short-sleeve top from River Island partnered with a pair of Khaki Pants from Uniqlo. To look like geek, but definitely hot, I will wear a pair of eyeglasses from Ray-Ban. Also, it is always a necessity to "color-coordinate" your accessories from your bag down to your shoes, watch and shoes. Look well for tomorrow's office shift, mates. Today's segment is the first time I incorporated women's outfit suggestion. I have to admit, girls love to ask questions than boys. So for their office look, girls will never look bad with white top partnered with a pencil skirt (both from Forever 21). To add fun to the monochromatic look, you can partner blue shades of bag, accessories and pumps. To seal the look, a simple black strap watch will make the entire ensemble the best. Hope you will like the layouts I have made for lads and gals. Happy shift tomorrow, working stylish citizens! That pencil skirt though! Everything's going all right with all the blue out there! I love both the men and women outfits especially the accessories. I would have loved to grab one.. I love to take men outfits cause I prefer such kinda outfits more. I love the stuff you picked for the ladies. It's nice how you've incorporated some color in the usual neutrals that most women wear for work. Thank you Russ, I think most of the girls are very fashion-forward and this will definitely fit them. I like to go with light pants and dark top because it really stands out. I also like that you use more earth colors in this outfit. It brings in more contrast with the dark top. I love your choices, very decent. Not so dull and boring, a piece to rejuvenate your corporate look. Yeah, it's hard to be stylish if you're in a profession/company where uniform is required. That does not only count in the case of nurses. :) A pair of Ray-Ban glasses is enough accessory to complete a decent look. The navy blue shirt and the khaki pants is a great combination. I would wear that myself. love both layouts. The gals blue-themed outfits really suits my taste. Spring look, isn't it? Thanks papaleng! I like the bag in the picture you posted. It looks adventurous. Canvas leather bag for men is rare to find on local store. If you could share a local store you know who sell a similar item, that would be very much appreciated. Thanks! Agreed, I have been looking for for that kind of bag but geeez! it is hard to find. Will let you know once I found one! I'm dying to get a pair of eyeglasses like that! I saw one before somewhere in Divisoria (it's unbranded) and how I wish I have bought it. But I'm currently eyeing on something similar from Sunnies Studio. Love the whole look. I always love my khakis. Combing it with wayfarers were pretty awesome back then and I guess up to now. ;) Nice Post!! I love those combos on the style front.. love the get up on it. It's nice that you have incorporated women's outfit in this Style Template series of yours! I love it! Great combination indeed. That men's outfit looks awesome. I don't know about the bag though, I mean, looks bulky? Nope?